The Car Salesman – Will we see Sir David Attenborough tracking these men and women down with a film crew in the not too distant future? John thinks so. 2017 will be the year that thousands of motorists will change the way they buy new cars FOREVER; not from a slick Car Salesman in a sharp suit – but directly from their lap-tops, tablets and phones without ever visiting a showroom. As a former Automotive Industry Senior Manager with over thirty years of industry experience and now a Business Coach, I am predicting that as the digital age moves on at an ever increasing rate, the typical Car Salesperson is going to disappear alongside the other jobs that I predict will disappear over the next decade or so. The Automotive Industry is gambling that buyers want to change to the convenience of buying online, in preference to haggling with a dealer. Already this year three major car manufacturers have launched new direct sales websites, with many others expected to follow very quickly. If car buyers take to buying online, the days of the sharp suited car salesman are likely to become as extinct as the Dinosaurs. This is by no means a new idea, previous attempts to remove the “dreaded” Salesperson from the whole process include Daewoo Cars and ASDA-Drive, but the technology was never really around to support the idea. In the case of Daewoo however, they certainly rattled a few cages and forced the hand of a few manufacturers to look at their own practices in terms of customer care and warranties. Daewoo Cars – Their brave but flawed foray into “direct sales” caused a great deal of fuss within the ranks of the motor trade. That said, they started a revolution way back in 1995 that’s swiftly gathering momentum in our digital on-line world of today. But will internet sales equate to lower prices? Experience tells us that it will as has been the case in every other “Digitalised” part of the retail industry. By taking the Dealership and the soaring costs associated with it (Staff, Buildings, overheads) out of the equation, this will enable the manufacturers to reduce their bottom line and reduce the price of the cars. With on-line car brokerage websites already stealing business from the traditional showrooms, Manufacturers have been frightened by the way the likes of the on-line “bucket shops” do business, and they want to take back that market by launching their own direct sales platforms. So far three major Manufacturers have launched their websites; Hyundai, Smart and PSA Automobiles (Citroen – DS & Peugeot). According to these Manufacturers the whole process can take as little as thirty minutes, although in practice that is probably only achievable if you have already decided on the exact model you want, and how you are going to pay for it. If you want to arrange a test drive, this will still be possible. Customers can now go on-line to choose the exact specification they want – including colour and engine size, getting a price to part-ex their current car, sort out a finance deal then simple choose whether they want their new model delivered to a local dealership or directly to their front door, and then click “BUY”. All the same, for the first time ever, it is entirely possible for a motorist to buy a new car without going anywhere near a dealer, and never having to deal with a car sales executive. 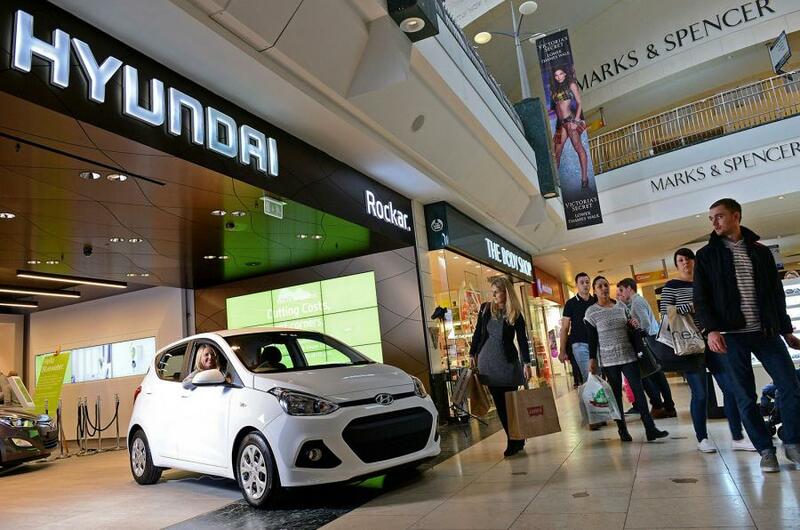 Pop up dealers and manufacturer owned sites are becoming commonplace in larger shopping centres such as Bluewater and Westfield. This is Bluewater in Kent. Anyone who is sceptical about whether online sales will work should visit Bluewater in Kent or the London Stratford located Westfield shopping centre. The former features a Hyundai outlet while the latter displays the wares of Jaguar Land Rover. In fact, JLR claim to have sold over a thousand vehicles in their first year of trading this way. Make no mistake, traditional sales executives are already a thing of the past at these sites. Instead, potential buyers are greeted by “store angels” whose role is to simply provide information and guide customers hand in hand through the online purchase process. So does this mark the death of a salesman? well in all honesty I have to say probably not. But the end of the new car sales executive is potentially almost guaranteed as buyers have the added protection of buying directly from the manufacturer just like Daewoo pioneered back in 1995. However, with the purchased of used cars being so much more complicated, I can’t see that kind of sales person disappearing completely – merely an endangered species perhaps? Previous Range Rover Evoque Landmark Edition to celebrate 600,000+ sales. Whoever came up with this “store angel” idea may have problems coping with the real world. I had a look at one of these websites and it was very poorly produced – if I was a car brand I wouldn’t want to be associated with it. Are Dacia also effectively doing this? Bringing cars closer to punters via pop up shops seems a good idea. I think many expensive out of town/trading estate dealer outlets could become white elephants – I can think of one three franchise site which is now a supermarket after only having recently had a lot of rebuilding work. Most punters will still need the confidence of access to technical backup and being able to touch the metal. Irrespective of what people say about dealers and salesmen, there will always be a place for them. Secretly, people love to lock horns with them and I for one certainly do. Evil necessaries that’s what they are. Just like estate agents.